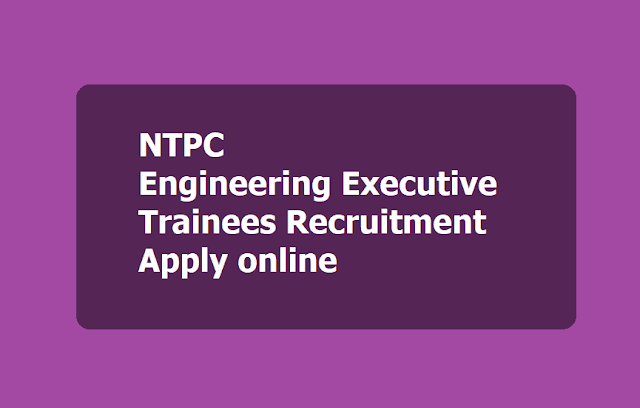 NTPC Limited Engineering Executive Trainee Posts 2016: NTPC Limited has published the Engg. Executive Trainees Posts 2019 recruitment notification and this Recruitment of Engineering Executives Trainees through GATE-2019. NTPC Recruitment 2019 for hiring of 360 Engineering Executive Trainees through GATE 2019. National Thermal Power Corporation Limited (NTPC) has invited candidates to fill up Engineering Executive Trainee posts. The recruitment will be conducted through GATE 2019. Candidates who are interested in the post can visit the official site of NTPC at ntpccareers.net and apply for the same. The last date to apply for the post is till January 31, 2019. Educational Qualification: Full-time Bachelor’s Degree in Engineering or Technology/AMIE with not less than 65% marks, as per respective Institute/University norms. Age Limit: The upper age limit is 27 years of age. Pay Scale: Selected candidates will be placed in the pay scale of Rs 60,000- 1,80,000 at the basic pay of Rs 60,000/- during one-year training. Other Details: The selected candidates shall undergo one-year training at various places. Candidates can check official notification for more details. Selection Procedure: Eligible candidates will have to appear for Graduate Aptitude Test in Engineering (GATE)-2019. Based on the GATE-2019 marks and requirement, candidates will be short listed for Group Discussion and Personal Interview. Candidates need to secure minimum qualifying marks in GD & Interview, before being considered in the merit list. Please note that for ET-2016 recruitment, GATE scores of 2019 will only be valid. For detailed information on GATE-2019, candidates may log on to http://www.gate.iisc.ernet.in/. The candidates, who have applied online for GATE 2016, will receive their GATE-2016 Registration Number printed on their admit card. On receipt of GATE registration number, the candidates need to apply on-line for NTPC ET 2019 on the website www.ntpccareers.net from 10.01.2019 to 31.01.2019. Last date for online registration of application by candidates in NTPC: 31.01.2019.